According to legend, Hemamala hid the relic in her hair ornament and the royal couple disguised themselves as Brahmins in order to avoid discovery. They set sail from Tamralipti, a port at the mouth of the river Ganges, and landed in Sri Lanka at the port of Lankapattana (now Ilankeiturei). It is said that Sri Lanka was chosen as the new home for the tooth relic because the Lord Buddha had declared that his religion would be safe in Sri Lanka for 5000 years. 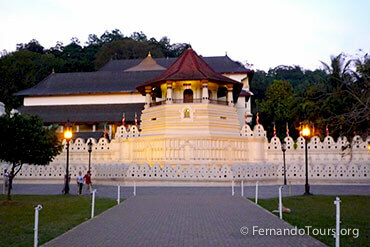 Temple of the Tooth is situated in Kandy.